All non-profit organizations have a Board of Directors. Basically, there is no single person who is “boss” at OPIRG-Windsor. Rather, the board collectively manages the organization. Compared to larger non-profits, OPIRG-Windsor has maintained an informal Board of Directors. Anyone is welcome to attend our meetings. We operate using consensus decision-making and we strive for effective meetings. How is being on the board different from other volunteering? While volunteers and action groups mainly concentrate on issue related work, the Board of Directors is responsible for organizational policies, commitments, yearly planning, budgeting and financial accountability. Sometimes board members are involved in one or several action groups as volunteers. We encourage members of the board to be involved in action groups to ensure that board members remain conscious of volunteer related issues and have a good sense of what is happening throughout the organization. There are 7 student positions and 2 community positions. The primary responsibility is to attend board meetings that usually last two hours. Board members are asked to become familiar with all the material in the board manual and the action group guide. Board members are asked to participate in at least one action group. While it is preferable if members are in Windsor during the summer months (especially because this is when we do most of our planning for the year), we often have to adapt to a smaller board during this time. Board members also take on a portfolio. Portfolios are areas of organizational responsibility that include volunteer coordination, communications/promotion, OPIRG Provincial liaison, resource centre, board & policy development, treasurer, and staff liaison. It does not mean you have to do all the work yourself, but that you are committed to initiating programs, bringing new issues to the attention of the board and finding people willing to assume tasks under your portfolio. A part of staff time is assigned to different portfolio responsibilities. Portfolios require at least two hours a week of your time. Further responsibilities can be found in our policy on Board Rights and Responsibilities. No. OPIRG-Windsor is an organization committed to training people in new skills. As a board member you will learn about our organizational structure, financial procedures, consensus decision-making and effective meetings. As a participant in our highest level of decision-making, obviously board members must be committed to OPIRG-Windsor’s mandate that is to engage in research, education and activism to promote an environmentally sound and socially just world. Our Basis of Unity (by-law #2 see below) further articulates this vision. What will I learn from the board? Participating as a member of the board offers individuals the opportunity to learn a wide range of skills such as project management, decision-making, community networking and organizational skills. Past board members have found the position to be challenging but also exciting and a real learning experience. There is no remuneration for sitting on the board of directors but any expenses are covered. What if all the positions are filled and I still want to be involved? OPIRG-Windsor also maintains ex-officio board of directors positions for persons that want to be involved in our board operations. For the vast majority of our board business, ex-officio members are treated just like other members of the board and participate in decision-making. The nine member Board of Directors collectively manages the organization. Core staff are those positions that are paid from student fees. At present there is only one part-time co-ordinator who shares responsibilities with the Board of Directors. We usually have some staff working on various projects and activities that are paid through a grant. Grant staff usually report to the core staff responsible for the activity or project. Our volunteers are organized around issues through action groups. Action groups usually meet weekly or biweekly to plan and implement campaigns. Action groups are responsible to the Board of Directors usually through a staff person or a board member but work independently. Our core funding each year comes from undergraduate and graduate student fees. These fees are collected by the University and forwarded to the University of Windsor Student Alliance (UWSA) and Graduate Student Society (GSS), who in turn forward them to us. Students may come for a refund during opt-out period (two weeks at the beginning of each semester). We also sell community memberships and supplement our core funding with government grants, donations and other fundraising activities. There are many other OPIRGs (Brock, Carleton, Guelph, McMaster, Ottawa, Peterborough, Queen’s, Toronto, Waterloo, York) Each OPIRG is autonomous. We belong to a Provincial network. The Provincial organization is incorporated and has charitable status. The function of the Provincial organization is to provide a mechanism to support new OPIRGs get started, offer training for board and volunteers (OPIRG Training School, Public Interest School) and networking opportunities (Provincial Board Meetings). The Provincial organization has one part-time staff. A board member and staff person from each local sits on the Board of Directors. Each OPIRG takes on a particular function for the Provincial organization. Each year OPIRGs commit funds for the various meetings and activities of the Provincial network. Staff from the eleven locals get together several times during the year for professional development. Regular Board meetings are held twenty to twenty-four four (20-24) times a year: weekly in September, October, January and February and monthly the rest of the year. Special meetings may be called from time to time. An annual general meeting of the membership is held once a year. 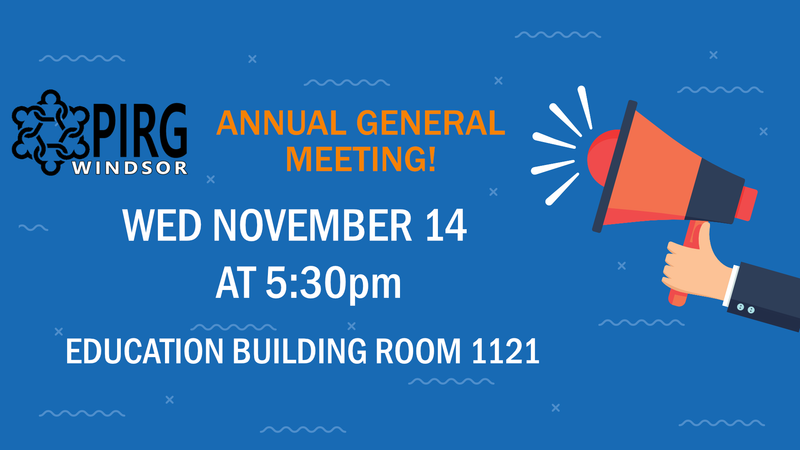 Board members are expected to attend as many board meetings as possible and the annual general meeting. Regrets should be advised. If they are unable to attend on a regular basis they must discuss this with the board.